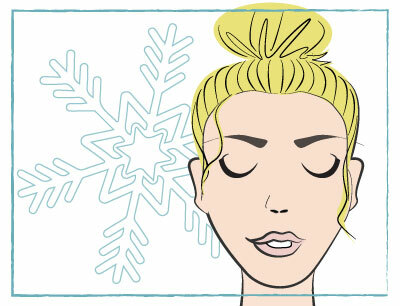 Protect your skin from the cold with soothing winter treatments! Tight skin, cracked lips, chapped hands and the constant feeling of discomfort... No doubt about it, winter is here. The skin can be aggravated by cold conditions and therefore deserves a lot more care. Quick! It's time to get your beauty routine in place, ready for winter! Say 'hello' to soothing and restoring treatments! 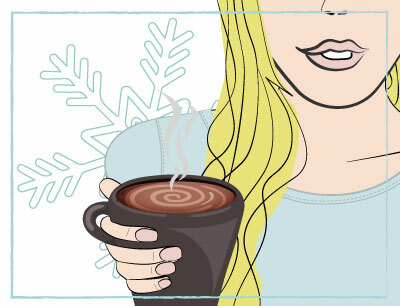 Winter can be really tough on our skin: dehydration becomes the no. 1 public enemy! Throughout winter, our skin has to endure quite a rough time. The cold air dries it out, the wind can often bite and clothes to wrap-up warm can feel irritant… There's so many factors which make skin more sensitive and weaken its hydrolipidic film. We therefore need to treat it with more soothing treatments as soon as the wintery weather hits! For normal or combination skin (and yes, combination skin also needs to maintain a good level of hydration! ), lather your skin with moisturising agents to keep it protected throughout the day. Use and abuse moisturisers to hydrate your skin until it can't take anymore! For an extra layer of hydration, apply a serum before your day cream on dehydrated skin. Finally, once a week, feel free to use a hydrating mask too. For dry and very dry skin, change your moisturising cream to a more nourishing and non-comodegonic cream. Look for active ingredients such as: hyaluronic acid, ceramides, shea butter and nourishing oils. For skin redness and irritation, go for repairing creams and soothing treatments (cold cream type) to instantly relieve discomfort, as they contain a higher concentration of oil than water. In the evening, swap your makeup remover lotion for a more nourishing natural oil (like sweet almond oil, for example) and choose a night care treatment enriched with glycerin to repair the skin barrier and protect it from aggressions the following day. Twice a week, feel free to apply a hydrating mask. Those that you leave on skin overnight are particularly effective during winter to restore baby-soft skin for when you wake up! A little extra: Consider changing the texture of your foundation or BB cream (as well as the shade!). Look for more cream or fluid textures, enriched with moisturising and nourishing active ingredients, rather than powders, which aren't suitable for dry skin. Optimal light moisturising cream is suitable for normal to mixed, dehydrated skin. Elixir moisturizer for all skin types. 30% organic and fair trade aloe vera face cream. Fluid moisturiser which is instantly absorbed into skin. Hydrating cream mask to regenerate all skin types. Intensely nourishing face care for dry and very dry skin. Soothes and protects skin from external aggressions. Our lips are often winter's first victim. They become dry and chapped, which can be extremely uncomfortable. What's the solution? Several times a day, generously apply an ultra-nourishing lip balm, to restore hydration and leave your lips feeling silky-soft again. To apply as often as necessary when lips start to dry out, we've got just the right product in mind, which will keep them hydrated all day long. The Nuxe Rêve de Miel Lip Balm is a quick, easy and effective solution, with a lovely creamy texture! Get back soft, supple and perfectly smooth lips. After the lip balm, you can then apply your lipstick without the worry of it splitting, thanks to your hydrated and replumped lips! The cold dehydrates the skin and the rubbing of wool or synthetic clothes makes the stretching of skin worse. Therefore, get started on a 'moisturising plan' with an adapted ultra-rich shower gel to care for your skin and limit the risk of tugging and burning. In the morning, before slipping on your leggings and big wooly jumper, and/or before going to bed, don't forget to hydrate your skin with a nourishing body balm, richer than your usual body milk. Once a week, give yourself time for pampering in a good bath (but make sure that the water isn't too hot!) as well as, for example, the Lipikar Cleansing Oil from La Roche Posay: the ideal product to nourish skin and restore a pleasant feeling of comfort. Care body double repairer nutri-moisturizing effect for the dry and very dry skin. 4- Don't forget your hands and feet! During winter, our hands and feet can suffer considerably from the cold. So this year, don't wait for the cracks and chaps to appear before treating them! To keep them soft and supple, wear gloves as much as you can and avoid washing them excessively to preserve the hydrolipidic film. Moisturise them several times a day by applying a generous layer of nourishing cream. Also, think about your feet. It is important to take care of them, most of all your heels, which can become cracked, with a moisturising cream. Once or twice a week, care for your feet with a moisturising and relaxing skin care to work throughout the night. Apply a sweet almond oil on your feet and slip on a pair of socks to allow for better absorption. Guaranteed soothing results! Cold cream treatment to relieve and soothe dry, damaged or chapped skin on your hands. Vegetal oil for the hair and face. For delicate and sensible skin types. Reduces calluses and rebel calluses in 7 days. Cream warming for cold feet. 100% cotton gloves to care for hands. One size fits all. As your skin is now well moisturised and hydrated inside and out, don't forget to keep yourself hydrated, drinking at least 1.5 litres of water per day, in the form of teas, herbal teas or infusions... Alter your diet towards more foods rich in vitamin C and essential fatty acids, such as oily fish, dry fruits and citruses etc. ideal infusion verbena and Mint after-dinner. Essential fatty acid dietary supplement for fatigue, vision and mental function.